The world-famous Instagram egg may be coming to the end of its time in the spotlight… as it’s starting to crack. It’s understandable, really. Suddenly becoming an internet sensation would be enough to make anyone crack under the pressure of new-found fame and stardom. Of course, this internet sensation is a fragile egg, so rather than emotionally cracking, it’s actually physically starting to fall apart. The egg became Instagram’s most liked picture earlier this week, beating Kylie Jenner’s previous record of 18 million likes, by 30 million. 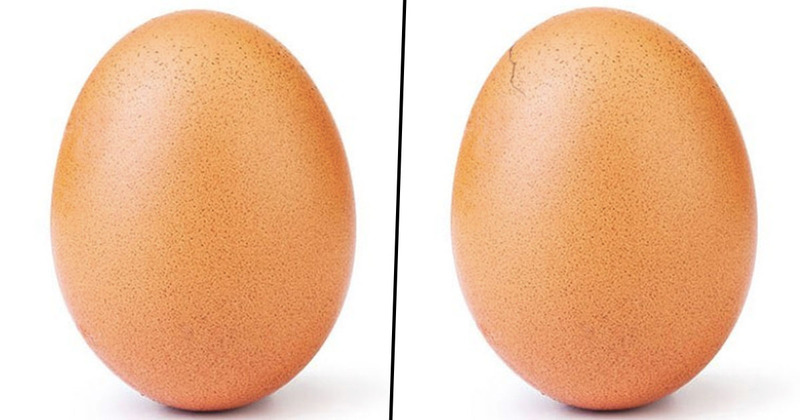 But just two weeks after the picture was first posted to the ‘world record egg’ page, a second picture appeared, showing the smooth, perfect exterior of the egg starting to show signs of wear and tear. The crack is only small, but it could be the start of the egg’s disastrous downfall. Now, world record egg doesn’t actually have any context around it, which I presume is all part of its hilariously mundane image. But this means while we can quite confidently guess it’s a chicken egg, we don’t actually know if it’s come from a supermarket carton, or straight from a coup? What I’m saying is, there could be a chick in there. The crack could be a sign of the start of new life; of a tiny animal entering the world from beneath a shell which has already captured the attention of millions. It could even be Dr Henry Wu bringing Jurassic Park to life via Instagram likes. That’d be a twist in the tale no one expected. I think world record egg might even break its own record for likes if a fluffy little chick emerges. I’m pretty confident everyone would love that surprise twist (a chicken, not genetically fucked up dinosaurs returning to Earth to wreak havoc), and cute animals are always a magnet for likes on Instagram. Alternatively, the crack could just start to leak yolk. But either way, the splitting shell has intrigued followers, with many people hoping for updates as the famous egg starts to fall apart. Hopefully we’ll be kept in the loop as the crack progresses! I know we’re only 19 days in, but it seems like 2019 is going to be the year for eggcellent online content.